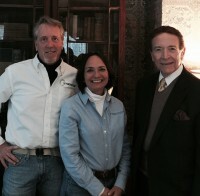 Left to right, Tom Schassler and Valerie Maziarz of Oxygen Sanitizing Systems, which remediates mold and offers other environmental services with Bill Primavera, The Home Guru. More than a dozen years ago, Ed McMahon, the famous pitch man and announcer for Johnny Carson, brought to the public’s attention the health problems that can result from living with toxic mold in the home. After a long legal battle, McMahon was awarded $7.2 million from several companies who were negligent in allowing toxic mold into his home resulting from a broken pipe, sickening him and his wife and killing their dog. As it happens, I had been aware for some years that I had a mold problem in my home, but not being sensitive to it, I thought it was a minor situation and let it go without remediating it. Last week, however, I learned that this was a mistake and my health has probably been affected to some degree by my procrastination. It started on Christmas Eve three years ago, before my living room in my antique house was converted to the office of my public relations business. At that time, my daughter said she could no longer sit in that room because she was having an allergic reaction to something there. To accommodate her discomfort, we moved our holiday get-together into our family room, but at the end of the evening I checked around and found that, indeed, in a corner in an 18th century glass door-enclosed bookcase-on-chest, there was mold forming on my collection of antique books. I simply closed the doors and let the situation just sit. A month ago, I was curious about a certain book, wondered whether it was in that that bookcase, opened the doors and was shocked to find that the mold had spread from the books onto the shelves. The smell had become somewhat noxious. By coincidence that very week, I received a call from Valerie Maziarz of Oxygen Sanitizing Systems, who had read one of my articles, to tell me about her environmental services, which included mold remediation. Wow, I thought, how synchronistic. Come right over, I told her. In short order she was in my living room-turned-office, opened the cabinet, and just from a visual check and the smell, she was aware that the problem was severe. “You’ve got a green mold forest growing in there. It’s a regular party!” she proclaimed. It seems that the antique books, with its cellulose in the pages, had provided a perfect growing environment for the mold. The next Friday evening, when the room would be empty for the weekend, Maziarz arrived with her partner, Tom Schassler, and her equipment in tow to literally replace the air in my office. Here is how the system works. The room was sealed off and generators with ultraviolet light and electric static discharge, produced converted oxygen in industrial-level concentration and quantities treating all surfaces and permeating all cracks, crevices, killing all microorganisms. The process is 100 percent green, chemical-free and EPA and FDA approved. Besides mold, it eradicates odors, allergens, bacteria and viruses, restoring the environment and improving health. After 24 hours, Maziarz and Schassler returned with commercial grade HEPA equipment specifically designed to remove all remaining particulates from the air and surfaces. Lastly, the office was treated with an antimicrobial surface protectant. When I returned the following Monday, I could feel that the air was “cleaner” and wasn’t aware that there was a problem until the problem was gone. This process restored my office environment and salvaged my antique book collection dating to the 1880s. According to tests taken before and after the process, Maziarz showed me that I had four different mold types in my office, one of which, Penicillium Aspergillus, was highly toxic and there in high levels. “Does this mean that my years of living with toxic mold in the environment could have affected my health without my knowing it?” I asked. Yes, I was told, it could have affected my health. Perhaps my experience, scary as it was, can be an alert to someone reading this. If you know of or suspect that you may have a mold problem in your home, please don’t procrastinate as I did only to wonder to what degree it may have affected your health. Take action immediately and have the problem addressed. Your health is the single most important thing to you. To reach Oxygen Sanitizing Systems, call 877-244-3080 or visit www.newindoorair.com. God speed.